The former legislator said we must reject the name “New NDP after they have been there for 8 years…we will not be fooled we are going with Luce…” he said to loud applause. “Green means go”, Mr Brewley started as he asked the people of D4 to vote for the VIP’s Hodge-Smith. 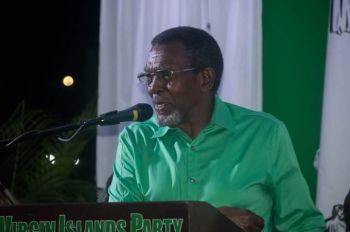 The fourth district race which includes McNamara, Road Town, Joes Hill, Long Bush and Lower Estate has tighten, however, many political pundits claim that Mrs Hodge-Smith is still the underdog. 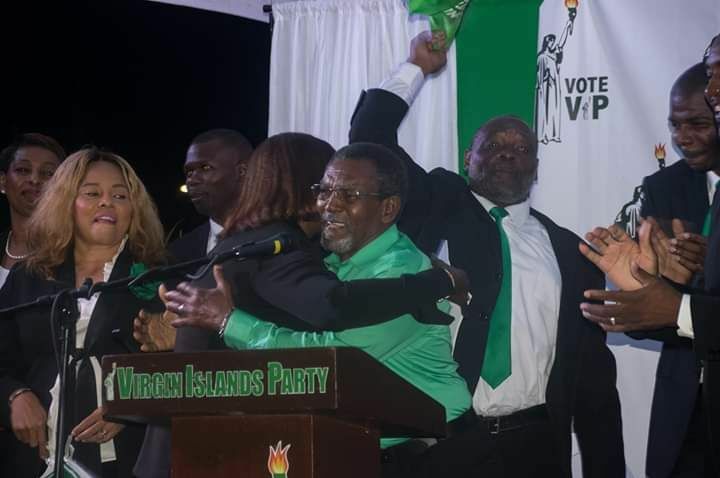 Mrs Hodge-Smith will face incumbent National Democratic Party 1 (NDP1), Hon Mark H. Vanterpool and Progressive Virgin Islands Movement (PVIM) aka ‘NDP 2’ Karl M. Scatliffe along with Progressives United's (PU) Dr Vincent G. Scatliffe. He loud mouth daughter ain’t running with NDP. Weird. Bring um all on, we are ready, yes, yes, yes! “FACT” loud mouth as you call her is not his daughter she is just another good deed GM has done. Y'all go sit down with y'all old style politics that's been holding back the young people of this country.the young people really need to move forward.nuff said. Now here who is talking G M sat there for many years and nothing to show he was a minister some of the time did nothing only make children with poor people .Bono you like Donald Thrimp in estimating crowds .You need to go back up forth hill and sleep . His steps only up and down taking people m-- so what the difference. You people must’ve gotten a raise in the white envelope to lie on GM but the truth can’t be erased. We need positive representation. Luce is a positive source to deliver. Don't mind the the cosmetic paving of roads and other convenient repairs of homes and guts. Don't be fooled by that Anguilla man who abandoned the district for the corrupt bindings for the pier park. He's a fraud. Vote Luce and the VIP ALL THE WAY. You keeping a funeral, that is the dead carrying the dead. You should have at least look for a live wire to nominate you. You dead, he dead, what else to be said? Hmm!!! (Dead) The brain of the haters who want to accomplish the things GM has done up today for we the people of the BVI and can’t. I think the name for that is JEALOUSLY. I endorsed Luce Hodge Smith as the next District 4 Representative and I am sure she will do a marvellous job for the people. She has the charisma and decency and most importantly she is not corrupt. Ask Mark to account for the excessive spending at the Pier Park and where to find the money. Don't be fooled with the road paving. Judging by the way the uneducated, poor, foot soldiers for dishonest politicians bashing the one honest politican that didn’t take bribes and the government money to make himself rich lets be real GM has done a lot for this country educate yourselves. Now you see why them crocked politicians wouldn’t spend money on you all it is to keep you ignorant for such a time like this slavery all over again here is the white envelope, turkey and ham they wouldn’t even give all you the mule and 40 acres. I see why GM wouldn’t throw his hat in the ring this younger generation does have a clue once you conditioned their minds into believing they worthless and they belong in provety it is hard to reconditioned their minds even when you giving them a way. Good luck Luce you will need it!!! Luce will win. The honest people of the 4th district will not vote their children and grand children prosperity away by voting for Mark. Words like ethics, good governance, accountability and just clean decency are words that should resonate on February 25th 2019. Unless we want to continue down a path of lies, dishonesty, infidelity and unfaithful behavior then my people rise up and restore Virgin Islands pride. Vote VIP all 13. She was Direct or of culture, she could not direct nor did she have culture. She need to go SIDDOWN. The people who make the most noise about everything are those who sit on there butts and do nothing. Cowards!! !